The cable car has been rebuilt twice, most recently in 2008, to handle over 400 million riders this century. Tourists can also reach the top by hiking up the mountain and avoid paying the $26 ticket. Rio de Janeiro is commemorating the 100th birthday of the iconic cable car that runs to the top of Sugarloaf Mountain, one of Brazil’s most visited landmarks. The 1400m climb takes about three minutes in the cable car. Photo by Phil Whitehouse. An estimated 40 million people have taken the cable car ride since its first two-stage trip up Sugarloaf on Oct.27, 1912. 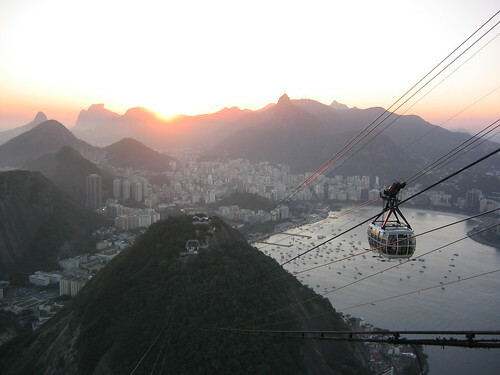 To reach the top of the 1,300-foot (396-meter) mountain, visitors must first take a cable car to the 720-foot (220-meter) high Morro da Urca, and there switch to a second car for the rest of the trip, which gives a breathtaking view of Rio de Janeiro. The 65-passenger cars take about three minutes to complete each stretch.